The Suzuki Solio was first showcased at the 2012 Auto Expo. The Wagon R-based car has now been spotted again. 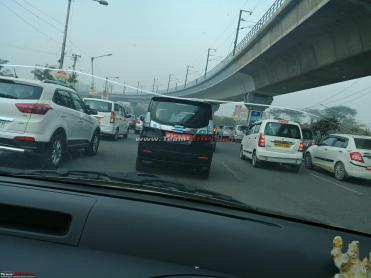 A completely un-camouflaged test mule of the Solio was spotted somewhere around Gurugram. However, it does have masking tape covering the Suzuki logo. In global markets, the Solio is positioned as a 5+2 seater mini MPV. It measures just less than 4 meters in length and is characterized by its tall side profile and overall boxy proportions. The rear of the car feature a thick chrome strip flanked by clear lens tail lights. It has an upright rear windshield and a roof spoiler. The Solio comes with a set of electric sliding doors in the rear. Inside, it gets a 3-spoke, multi-functional steering wheel and centrally mounted instrument cluster. The centre console is finished in silver trim and houses a touchscreen infotainment system. In Japan, the Suzuki Solio is offered with a hybrid powertrain. It uses a 1.2-litre, 4-cylinder petrol engine that puts out 90 BHP and 118 Nm of torque and a motor generator unit (MGU) paired with a 5-speed AMT. While the Solio has been spotted on Indian roads previously, Maruti currently has no plans to launch it in India.